For the past year I’ve been working on Tarsnap GUI, an open source cross-platform frontend for the Tarsnap backup service. Tarsnap is an online, fully encrypted, deduplicated, online backup solution, that’s been around for close to 10 years now (unlike other online backup offerings with a lifespan smaller than 5 years). 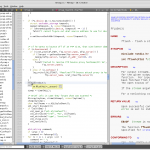 Starting with day one, full source code for the client tools was available for review and to establish trust. A bug bounty program is available and any kind of reporting is taken seriously, promptly responded and adequately rewarded by the creator and principal developer of Tarsnap, Colin Percival. Tarsnap uses a prepaid model, you add credit to your account and you’ll only pay for what you use and nothing more, no annual or monthly subscriptions. For the moment, the price per MB (SI notation) of storage (used monthly) and MB transferred is 250 picodollars each. The backend infrastructure is powered by AWS. Tarsnap was originally offered as a command-line suite of tools, in true allegiance to the Unix philosophy, very similar to the tar utility, for maximum flexibility and control over your backup routines and of great relevance for the server world. Die-hard Unix users and admins see no distinction between server administration and personal workstation and thus nothing is stopping you from backing up your personal machines and workstations the same way you would a networked server. Tarsnap GUI comes to the rescue here in filling whatever gap might be between the server and desktop workflows and for the people that like to keep real work inside the Terminal and all else contained in easy to use, slim, yet robust GUIs. What follows is a small tutorial on how to get started with Tarsnap GUI to back up your OS X desktop. Setting the platform differences in the Installation and Scheduling sections aside, this tutorial is very relevant to the other supported platforms too. First and foremost you need to register on the Tarsnap website and add some credit via the preferred method of payment (Credit card, Paypal and Bitcoin are accepted methods). Five bucks would suffice for a start. Read a bit on the homepage and getting started page just to get acquainted with Tarsnap. Tarsnap doesn’t ask, thus doesn’t need to store any personal information besides your e-mail address. At the moment of writing this tutorial, Tarsnap GUI version 0.8 and Tarsnap CLI version 1.0.36.1 are the latest offerings and installing from source is the preferred method of installation for all platforms, although we are working towards changing that at some point. What this will do is fetch the latest stable versions of the Tarsnap command-line utilities and the GUI front-end along with their dependencies from Github, compile from source and then add useful symlinks to the appropriate system directories. The Tarsnap command-line utilities are symlinked in /usr/local/bin and a symlink for Tarsnap.app should be in /Applications. If Homebrew is not a desirable option for you or you’re reading this with *Linux or *BSD in mind, the steps for installing manually from source are best described in the INSTALL dist file. 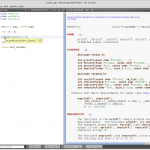 Some BSD flavors like FreeBSD, PCBSD have already incorporated tarsnap-gui into their repos or ports trees, or plan to like OpenBSD in next version, so it might be worth to look for it there before deciding to proceed with the manual steps. Upstream Linux RPM and DEB packages are being considered for a change. This is the setup wizard and will help you get started with using Tarsnap in no time. The first step for the wizard is to find the Tarsnap command-line utilities that are used to talk with the Tarsnap servers. In the Homebrew case, they will be located in /usr/local/bin and depending on the PATH environment variable for your current user the wizard will either direct you to the Advanced page to set that directory manually or proceed right next to the next step for the case where you already have it in your PATH. You don’t have to worry about the other settings in the Advanced page for now. This is where you fill in your Tarsnap account credentials from the Registration step. When you click on Register machine, your encryption key is created locally and an accounting record using the Machine name specified is created on the Tarsnap server and associated with a signature of the key. This is used for generating your service and credit usage reports per machine (or key signature, the machine name doesn’t matter much and can be anything you want), for your convenience, on Tarsnap.com. The actual key used for encrypting your data never leaves your machine. Your backups are safe as long as you will be able to hold on to this key privately. If you lose this key your backup data is gone forever. The actual path where the key is stored on your system, along with some useful advice, will be revealed to you in the last screen upon successful registration. That’s all it takes to quickly set up Tarsnap on your desktop, rather simple right? Let’s proceed by taking a first look at the main app window. The first thing you’ll see is the empty Backup pane. 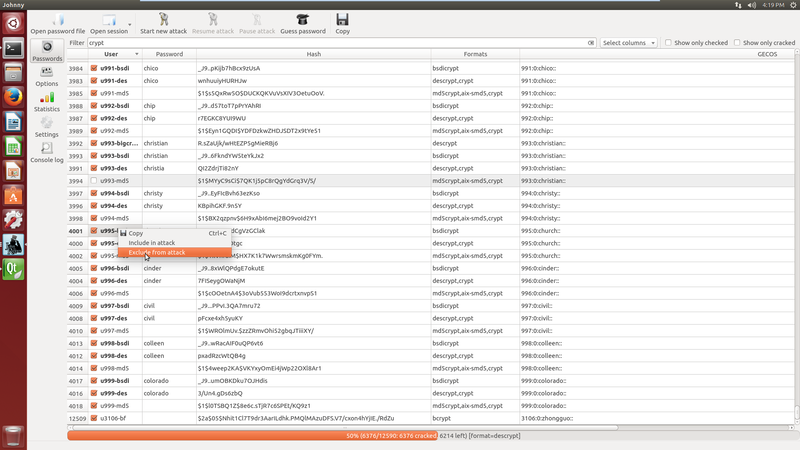 The Backup tab is used to quickly put to rest arbitrary files and directories of your choosing to Tarsnap. Think of it like a convenient one-time drop bin, where you can easily drag and drop important files, set a name for the archive, hit Backup button and forget about it. The archive name, Tarsnap-tutorial in this case. 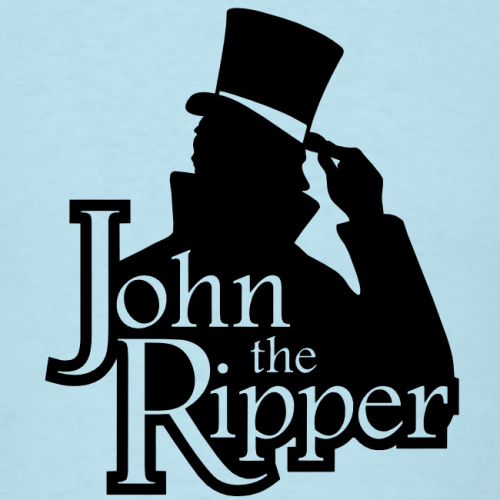 The name can be any arbitrary combination of characters, excluding the null character and must be unique amongst all the existing archives. The archive size, 4.83MB in this case. This is the original size of all the items included in a backup, before deduplication and compression. Unique data, 2.15MB in this case, what you pay for. This is the archive size post deduplication and compression. As you can see, Tarsnap is smart enough not to waste your credit on duplicate data, even for single archives. A command. This is the exact command-line used by the application to create the archive. Every single action executed by the GUI app has a direct command-line equivalent, which can be reviewed in the Help -> Console pane. Total transparency, control and debugging capability. You can even use this to learn how to operate Tarsnap at the command-line. Contents listing. This list contains all the source files and directories included in an archive. Every Tarsnap operation is accompanied by a status bar message. When Tarsnap is working with the server a loading circular orb will animate to indicate activity. All of the status messages are logged and can be reviewed by expanding the Journal with a click on the arrow head in the status bar. A name, Tarsnap Tutorial, in this case. This name is prepended to the archive names for this Job. Files and directories selected in the File System tab. This is what you want to back up as part of this Job. Options particular to this Job. We’ll take a look at this later on. Archives pertaining to this Job. None yet thus pane is disabled. I’ve added 5 extra screenshots to the directory since the previous on-demand archive. If you take a look at the Unique data label you’ll notice that only 1.25MB of data has actually been uploaded to the Tarsnap server and thus you’ll only be charged for that. This is the deduplication magic in action that works between all archives created with the same key and will save you a lot in the long term when backing up from the same sources of data in what amounts to, basically, incremental backups. Tarsnap also compresses your data after deduplication step for maximum storage, bandwidth and resulting cost efficiency. In this case I’m backing up PNG files which are already compressed data formats (also MPG, AVI, MP3, MP4; in general any modern media format has some level of compression), but if I were to backup source code, text files, documents and other raw formats the amount of savings will be even greater. This also means that it’s pointless and even detrimental to the efficiency of Tarsnap if you’re compressing your files manually before using Tarsnap. 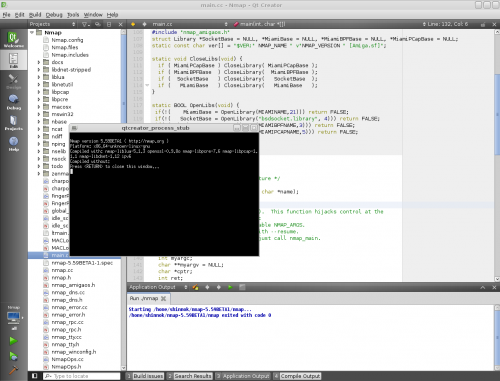 This is the basics of using Jobs with Tarsnap GUI. What you should do next is define individual Jobs for each of your important file system locations like Documents, Pictures, Desktop and your Work directory. You can back up all your Jobs at once by clicking on the Add job button drop down and Backup all jobs or selecting all Jobs and hitting CMD+b keyboard combo. For a full listing of keyboard shortcuts available see Help pane. Next we’re going to take a look at scheduling automated backups for Jobs. At the moment, scheduling automated backups for your Jobs requires a bit of knowledge about your Operating System scheduler and some degree of manual work. Given that Tarsnap GUI is cross-platform (OS X, BSDs, Linuxes and Windows in the future) and that every platform usually differs in the best choice for scheduling, it’s quite tricky to code a solution that applies elegantly and reliably for all, so for the meantime we’re left with a manual approach. I’m working towards changing that in a future release, if you want to find out when that happens it’s best you either follow the project on Github or subscribe to the tarsnap-users mail list (links at the bottom of this post). -j, --jobs Executes all jobs sequentially that have the 'Include in scheduled backups' option checked. The application runs headless and useful information is printed to standard out and error. /Applications/Tarsnap.app/Contents/MacOS/Tarsnap -h Usage: Tarsnap [options] Tarsnap GUI - Online backups for the truly lazy Options: ... -j, --jobs Executes all jobs sequentially that have the 'Include in scheduled backups' option checked. The application runs headless and useful information is printed to standard out and error. 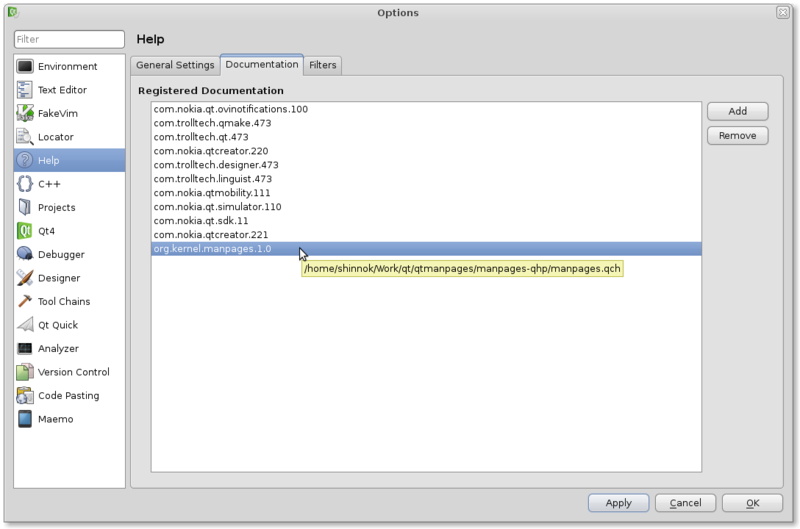 The option is disabled by default and you need to check it as shown in the screenshot. When executing Jobs in the background, Tarsnap GUI will have an icon in the menu bar and desktop notifications will notify you of what’s happening. If you click the tray icon or the notifications the app will fire up. Now if you’re reading this with Linux or BSD in mind, all you have to do to schedule your backups is replace Launchd with something like crond. What use are backups though without a simple method for restoring backed up data in case of need? 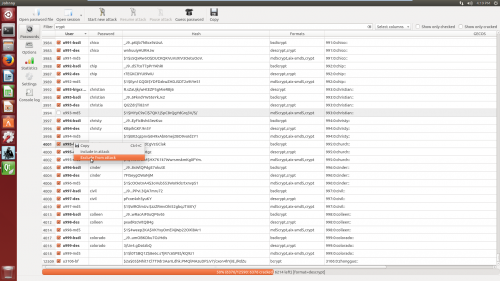 Tarsnap GUI takes care of that without much fuss. Let’s delete the Tarsnap tutorial directory and attempt a restore from the latest Tarsnap Tutorial backup by clicking on Restore latest archive button for the Job. Clicking Restore immediately commences the restoration of files in the last Tarsnap Tutorial backup. A couple seconds later, lo and behold, I have my work on this tutorial back. Not much of a surprise huh? Nobody likes surprises when it comes to backups anyway. While Tarsnap CLI and Tarsnap GUI is capable of much more than what is laid out in this primer, I hope this was enough of an introduction to get your feet wet and encourage you to start exploring the other things you can do with this setup on your own. If you prefer reading this tutorial in a PDF version here you go. This release continues on the track already paved by the previous release in terms of performance, code robustness and adherence to modern C++ practices and UI consistency, adds a bunch of new features like simulation mode, skip files flagged nodump in the file system and a persistent Journal, as well as numerous other improvements, fixes and adjustments throughout the whole spectrum. This release makes Tarsnap GUI leaner, faster and more robust overall. This release improves on the earlier v0.6 release, adds a bunch of new features like desktop notifications, skip files and the ability grab the Tarsnap credit from the website, along with a slew of general improvements, fixes and UI refinements. Better looking, leaner and more robust. These are arguably valuable for quickly reviewing scheduled backups that have completed while you were away. While the Tarsnap service is of immense efficiency and conveniency for server and scripted backups thanks to its Unix utility design, that same characteristic makes it a good choice for wrapping a desktop application with a graphical interface on top so that more users can benefit from truly secure and well designed backups as well as to easily define and use more complex backup routines from a comfortable and lean interface. 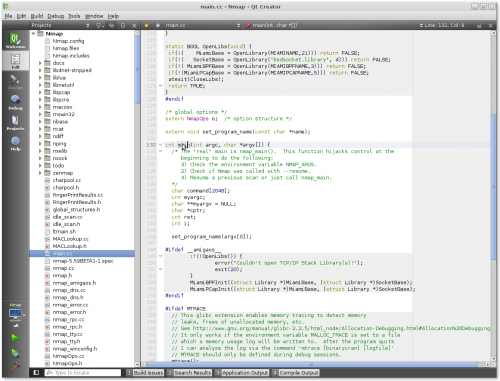 The application is cross platform, written in C++ with the help of the Qt SDK and is released under the BSD 2 clause license. 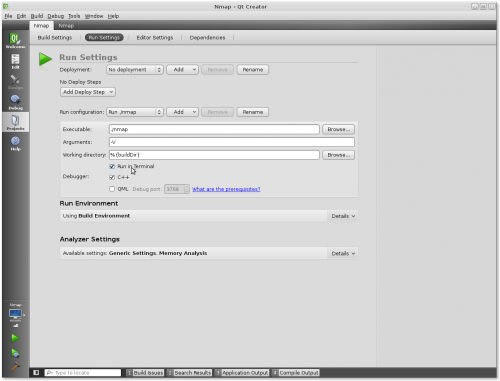 It has been tested on OS X Yosemite, FreeBSD and most Linux distributions with a wide audience. The current version is 0.5. There’s so much more to be implemented and ground to cover in both usability as well as Tarsnap options breadth and depth coverage. So stay tuned for further releases and announcements to this blog, @shinn0K, @tarsnap or the tarsnap-users mail list. Head over to this overview Wiki page for extra details regarding the current release. Also read the announcement e-mail on the tarsnap-users mail list. As explained in the wiki page and the announcement e-mail, there are no binary redistributable packages for now, mainly because there aren’t any for the Tarsnap command line client either. This might change in the future though. As with any Open Source project, I encourage you to participate via discussion, feedback, code contributions, bug reports, fixes and platform testing. Basically any type of constructive and informative contribution is very much welcomed. 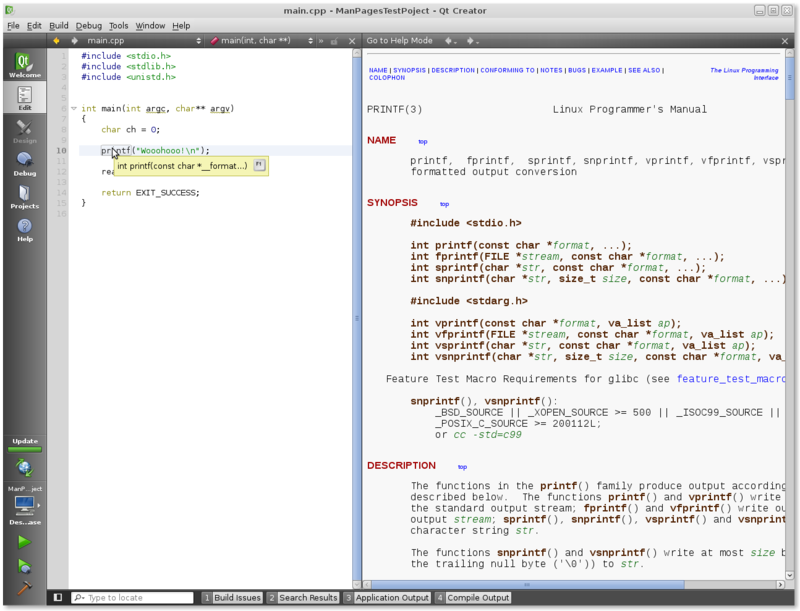 Inspired by my previous post on using Qt Creator on non-Qt SDK projects, I went a step further and integrated the Linux Man Pages section 2(system calls) and section 3(library functions) as a context help module in Qt Creator and Qt Assistant. 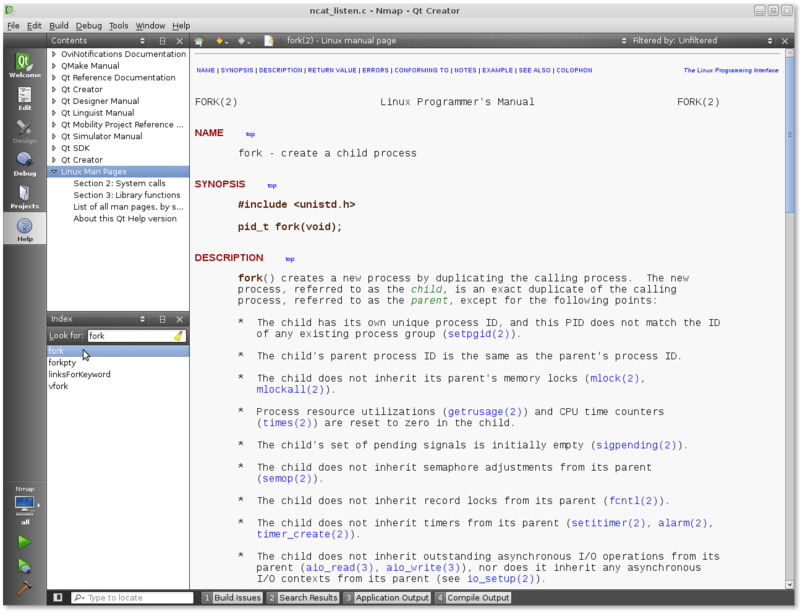 Having documentation on all of the Linux system calls and system libraries at one click away(F1) is a great advantage and boost to productivity when doing system programming on Linux(and not only), especially now that Linux has around 400 system calls and GlibC 1400 functions. 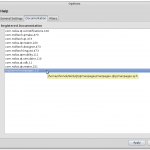 The Man pages have been bundled as a Qt Compiled Help module that is easily plugged into Qt Creator or Qt Assistant. The HTML pages used are the official ones available at kernel.org, the online version. 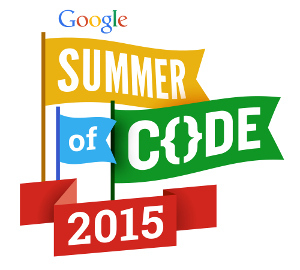 I have removed the Google search and StatCounter Code since they are not necessary for this purpose. 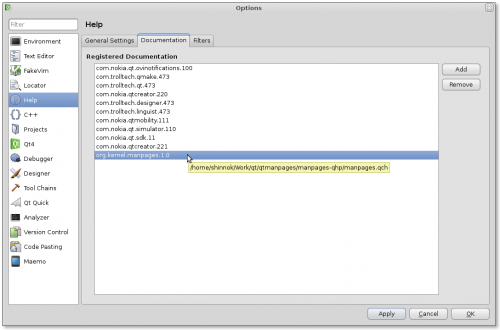 The manpages are accessible by context help, when pressing F1 on a declared function like select or printf or by visiting the Help screen and browsing them alphabetically or by searching the index. You can find more information about them right there in the Help screen in the Linux Man pages category. Remember that if you remove or move the .qch to another location Qt Creator will not be able to find it anymore, since it doesn’t create a copy for itself. It’s best if you put in a place that makes sense in this manner. If i see demand for this module, I’ll move the instructions on how to import the Linux man pages Qt Compiled Help module, as well as download links, to the main site(shinnok.com) and I will try and update them every so often once I hear of important changes to the man pages. Till then, this will be a blog simple post. Inspired by this post(read it because I am going to reference it) on the Wikitech mailing list I was inspired to write about Qt Creator, the IDE that I use for about an year now for almost any kind of C/C++ project and which I think it is pretty close to being a type 1 Integrated Development Environment, as written by Paul in that e-mail, which is a real and useful IDE, at least for my use cases. 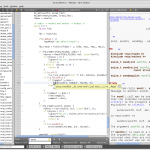 Qt Creator is a powerful and flexible IDE most useful for C/C++ code and especially when used in combination with the Qt SDK. 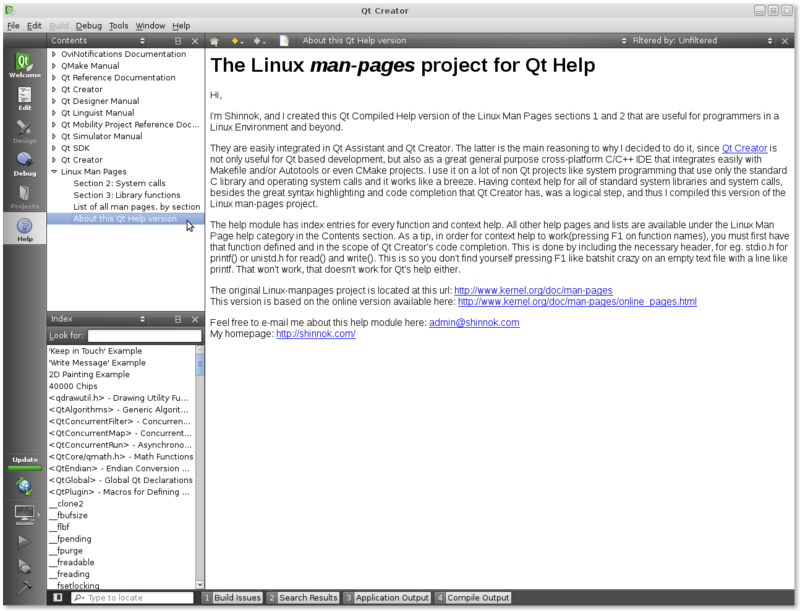 However, due it’s extreme flexibility, Qt Creator can be tweaked to work with almost any kind of C/C++ source project, from the default qmake project files to CMake, GNU Autotools(the GNU Build System), standalone Makefiles or even custom commands for direct access command line steps for direct compiler and linkage directives. 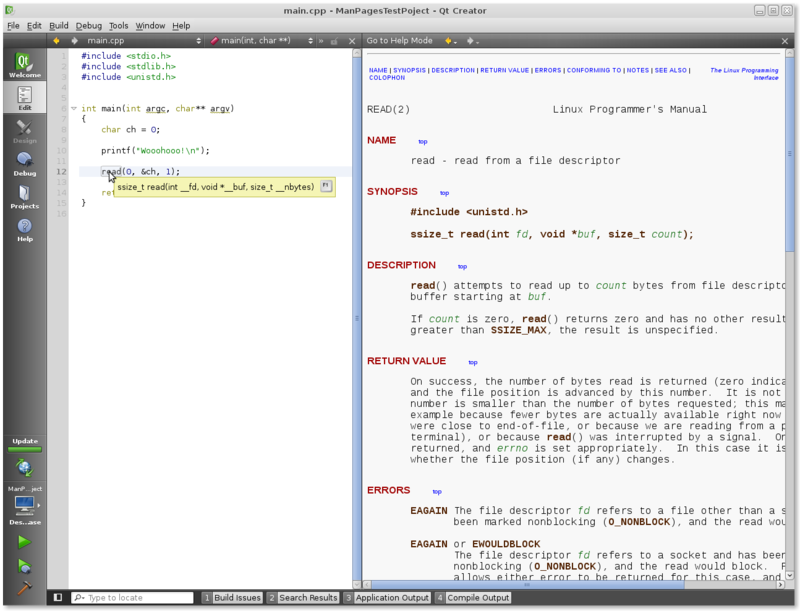 While I prefer type 2 IDE’s for most of the day, which are powerful text editors like Vim for casual hacking or minor code modifications, which VIM excels at, especially with its modal mode, delving into an entirely unknown code base(especially a big one) or using new libraries and apis or for long coding sessions, in a simple text editor, even as powerfull as Vim or Emacs, things start to get inconvenient pretty easily and you will notice a slow down, mainly because of the poor code browsing, syntax highlighting(C++) and code completion capabilities that they posses. They are not to be blamed though and there’s also nothing wrong with them, they are simply text editors and not IDE’s. Since Vim is my favorite text editor, I tried various combinations of Ctags and CScope and all kinds of crazy hacks on top of that, just to be able to have code nagivation and code completion at least to some extent. You can find my Vimrc file in here, without Ctags and CScope, since that would make for entire post by its own. However, I got tired of it after some time, especially because it doesn’t work that nice with some of the crazy quirks that C++ for e.g. exhibits and because I have to keep the databases that those tools use up to date frequently and manually, for every project that I am working on. For terminal only access, coding like this is fine, to some extent, however, this seemed really overkill on my desktop, especially since I am running an X desktop with a GUI and knowing that I could do better to be more productive in 2011. 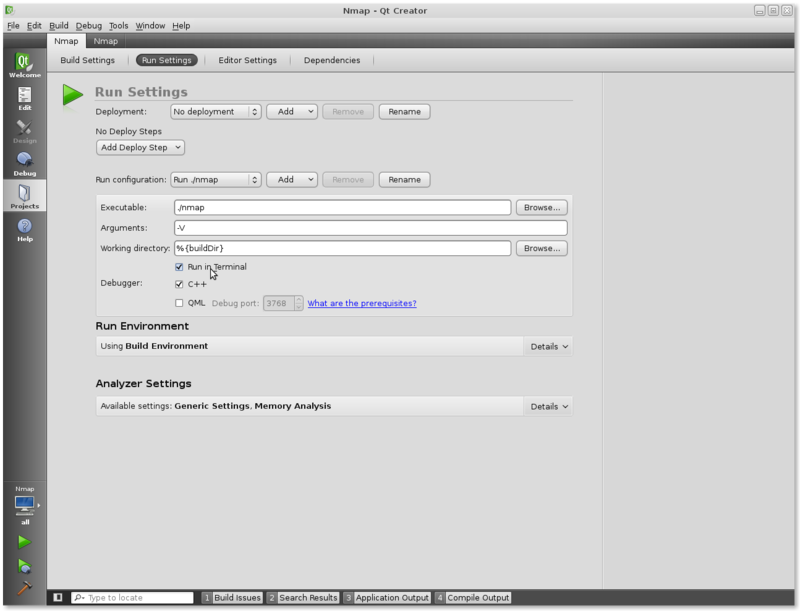 Support for integration with various Source Control Management tools like Git, Subversion, Bazaar, Mercurial, CVS and more. Although I only listed what I like the most on top of my head, Qt Creator has many cool and useful features and the only way to experience them all, is to start using it and you really should give it a spin, because as you can see, it’s feature list is nothing close to short. You can find some videos that show you some of the features I described above in action on Youtube, but keep in mind that they are kind of old(around 2009) and Qt Creator has very much evolved a lot since then. 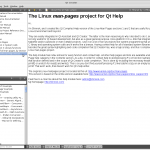 Now let’s get to the main purpose of this post, using Qt Creator with GNU Build System projects. 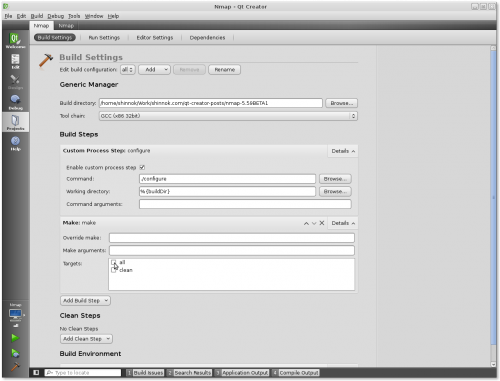 A project that follows the GNU Build System usually is composed of a configure file and several other inputs(configure.ac, Makefile.am) that help in creating the Makefiles that will build the actual project on the target platform. The GNU Build System is, of course, much more then that, but for this tutorial, that’s all you need to know and because these steps will also work for projects that have only the Makefiles for e.g. Download and install Qt Creator from http://qt.nokia.com/downloads. 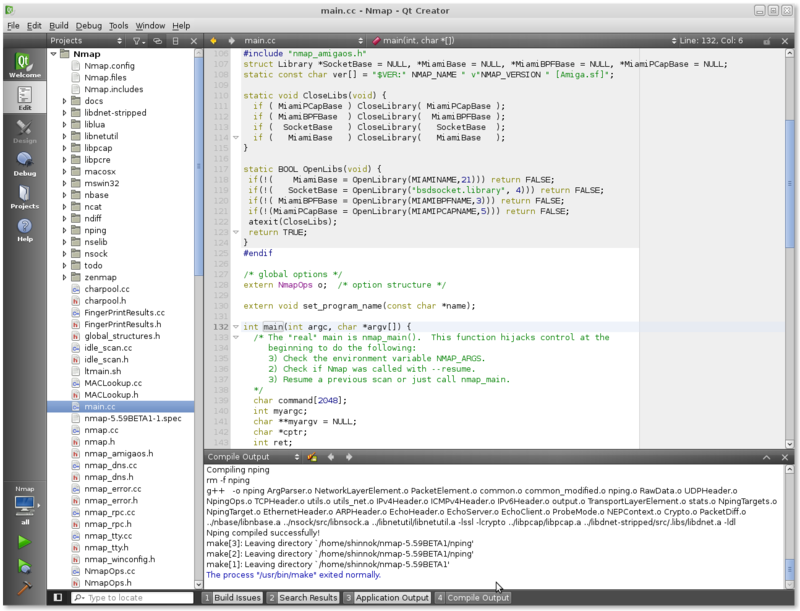 At the time of writing this, I’m using Qt Creator 2.2.1. I’m going to assume you’re going to be using Linux from now on, any distro should be fine as long as you are comfortable with it, however, I am using Debian(Squeeze). If you can’t make up your mind, just use Ubuntu. For Mac OS X and Windows steps should be similar. Decide on a project to use. I’m going to use Nmap since that’s what I’m working on currently and because it is the perfect example of a great open source project that’s low level enough to illustrate system programming using Qt Creator. You can download the latest version tarball from http://nmap.org/download(nmap-5.59BETA1.tar.bz2 is fine). After deciding on a project, you should install all of the development dependencies(the toolchain) that your chosen project needs, like the right compiler, libraries and other tools you might need. For Nmap, for e.g., we will need gcc, openssl libraries, libpcap, perl, python, etc. If you’re on a Debian like distribution(Debian, Ubuntu), luckily you can just do apt-get build-dep nmap and you get everything you need in one shot. If you do some tests builds from the command line, remember to clean the source tree before proceeding to the next steps, since you only want to add to the project only the base files and none of the auto generated files from the build system. 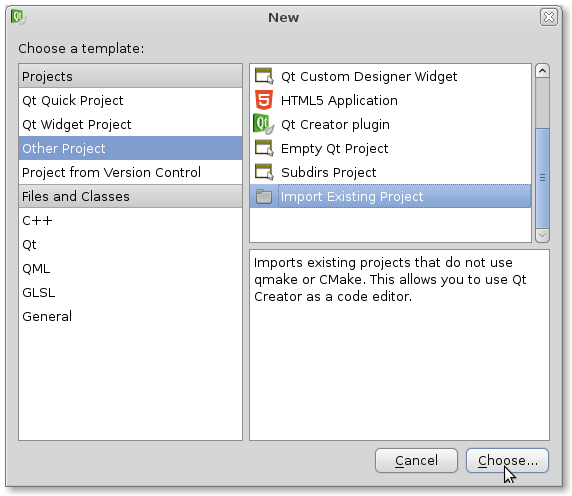 Assuming you installed Qt Creator successfully, open it and go to File -> New File or Project -> Other Project and click on Import Existing Project. Advance to the next screen. 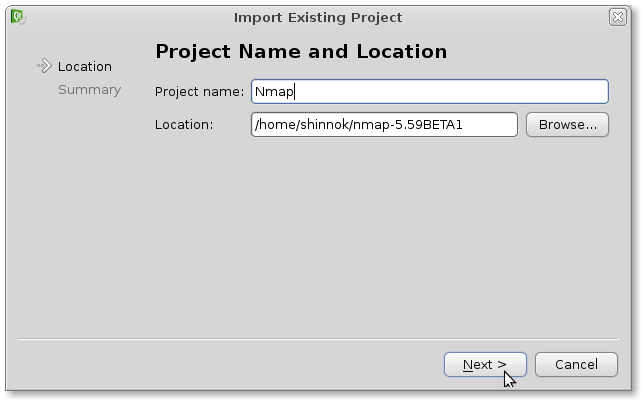 In the current screen, give your project a name(that name will be used for your project files too so don’t go crazy with spaces or special chars) and select the location to your project source tree. In the nmap example, Nmap is a good project name and for Location browse to the path where you extracted the nmap source archive. Click on Next. Nmap.creator.user – This one is excluded from adding to svn since it stores per user project settings. 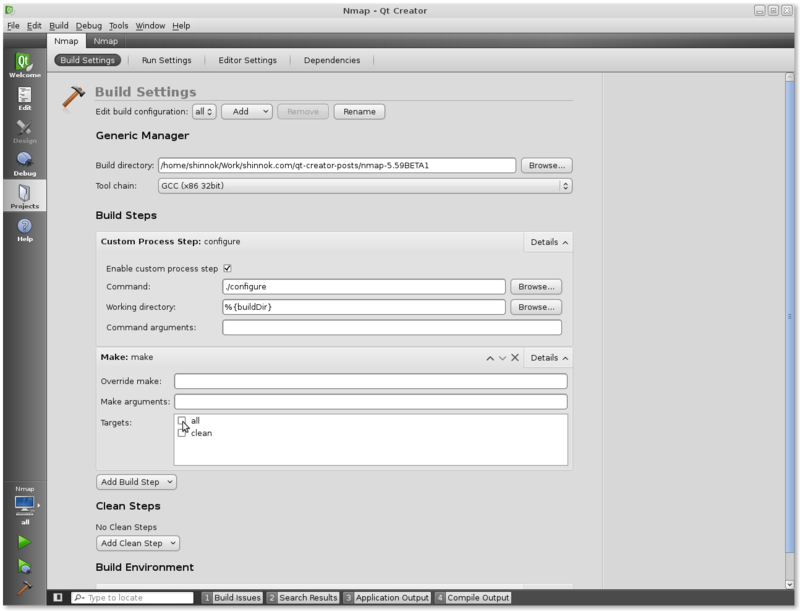 On the Build Steps section click on Add Build Step -> Custom Process Step. 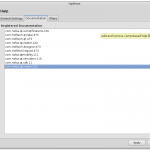 Click on Enable Custom Process Step checkbox and add the following command to the Command: text box: ./configure. Move this step to the top of the stack by clicking on the upper arrow that fades in when you hover the build step. This step, the configure process, can only be run once and then disabled, since you don’t really need to run it again unless you run make distclean or modify the build system. Now expand the Make step and deselect the all checkbox in the Targets section. We don’t need that argument for Nmap, since Nmap’s Makefiles doesn’t have an “all” target. Now all the make step will do is issuing the make command. 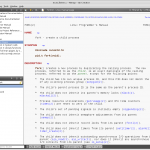 In the Executable: text box input ./nmap. 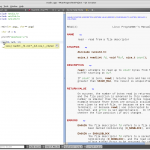 In the Arguments: text box input -V.
Enable the Run in Terminal checkbox. Switch over to the Edit mode on the left sidebar and press Ctrl^Shift^s to save your changes and start Building by pressing Ctrl^b. That’s it! 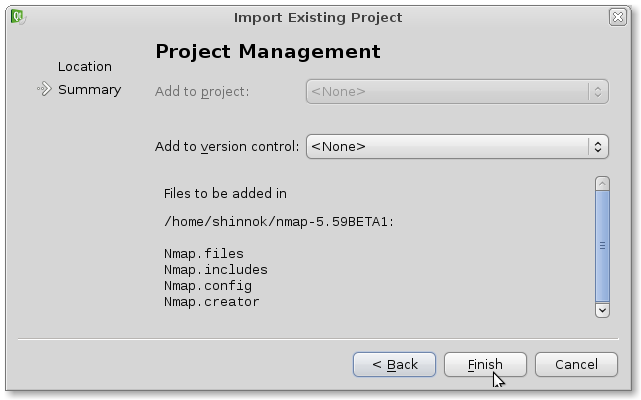 This is how simple it is to use Qt Creator with a project like Nmap, that has nothing to do with Qt or qmake whatsoever, all you need to do, is know a little bit about the specific project’s build process and toolchain and describe them to Qt Creator as build steps. I’ve been using this process on many non Qt projects like John the Ripper, skipfish, VCMI(Heroes 3 oss clone), GNU Coreutils and many more besides Nmap, of course, projects which are in both C and C++ and all I can say is that Qt Creator helped me a lot in the cases where a text editor didn’t(and shouldn’t try to) excel at. 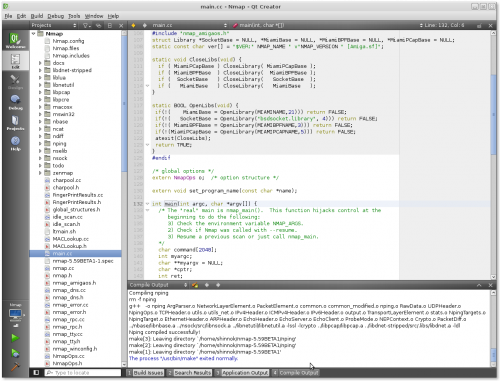 None of the other choices available as free and open source IDE’s out there could match Qt Creator in my opinion and I really hope that the Creator will continue in the same manner it has so far, free and open source, cross-platform, actively developed and supported, flexible and not locked to the Qt framework. 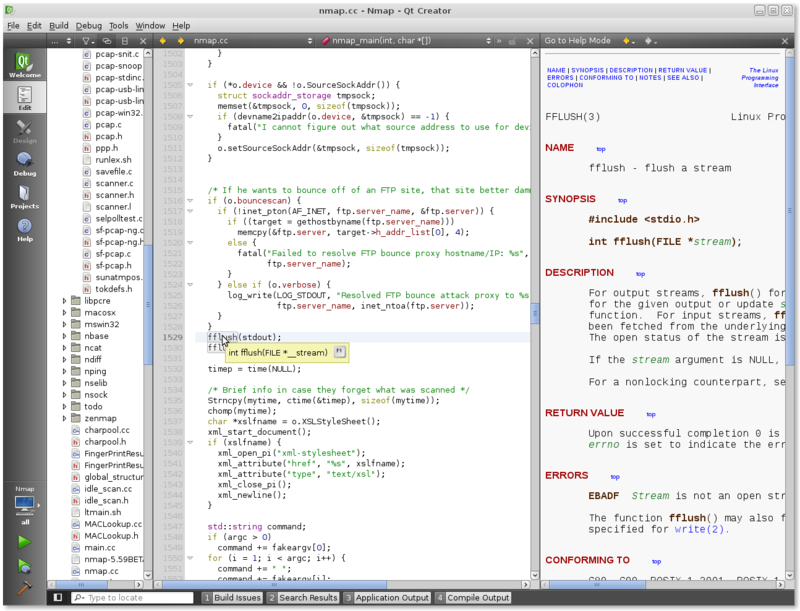 Here are other alternatives to Qt Creator that I’ve used in the paste and still use from time to time for specific certain tasks that they do well besides Qt Creator and adhere at least to the open source, cross-platform and good for native development rules: KDevelop, Code::Blocks, Anjuta and Geany (no, I’m not going to mention Eclipse and Netbeans since they are not that good for native programming). 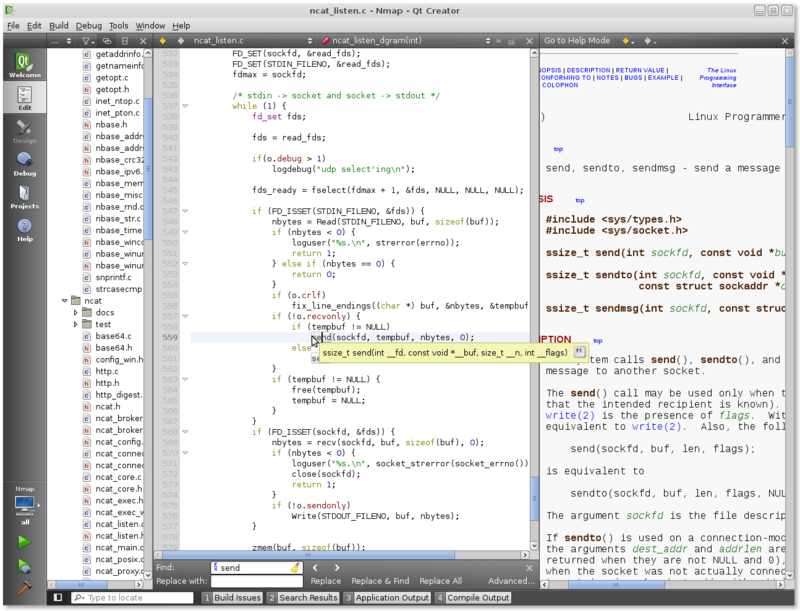 All in all, Qt Creator is a great IDE for general C/C++ development and even if it can’t currently beat the behemoth that is Visual Studio in certain aspects, it wouldn’t even be fair to compare them until Visual Studio will strive for cross platform compatibility, multiple compilers and debuggers support or the ability to use multiple revision control systems. Give it a spin, you won’t regret. 3D TV on its way to becoming a reality?